Premiering via Zane Lowe’s Beats 1 show. On Wednesday, Juicy J dropped a new single featuring the red-hot Travis Scott. Titled "Neighbor," the song premiered as Zane Lowe's 'World Record' on Beats 1 and Apple Music. 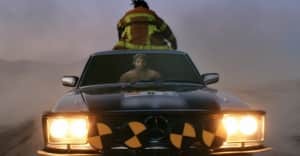 "Neighbor" features signature Juicy J ad-libs throughout along with a verse as Travis controls the song's hook over a woozy, descending synth melody, produced by Buddah Bless. Last year, Juicy enlisted the Astroworld rapper for a feature on "No English" off of his 2017 album Rubba Band Business. During the show, Juicy also told Lowe that he has an album finished, and has been spending the year producing for French Montana, $uicideBoys, and Wiz Khalifa among others. Thumbnail image courtesy of Bryan Steffy/Getty Images for iHeartMedia.